The stellate ganglion refers to the ganglion formed by the fusion of the inferior cervical and the first thoracic ganglion as they meet anterior to the vertebral body of C7. It is present in 80% of subjects. It usually lies on or above the neck of the first rib. This is the anterior tubercle of the transverse process of the sixth cervical vertebra, which lies lateral to and at a slightly higher level than the posterior tubercle, and against which the carotid artery may be compressed by the finger. The structures anterior to the ganglion include the skin and subcutaneous tissue, the sternocleidomastoid and the carotid sheath. The dome of the lung lies anterior and inferior to the ganglion. The prevertebral fascia, vertebral body of C7, oesophagus and thoracic duct lie medially. Structures posterior to the ganglion include the longus colli muscle, anterior scalene muscle, vertebral artery, brachial plexus sheath and neck of the first rib. The patient is placed in the supine position with the neck slightly extended, the head rotated slightly to the side opposite the block, and the jaw open. 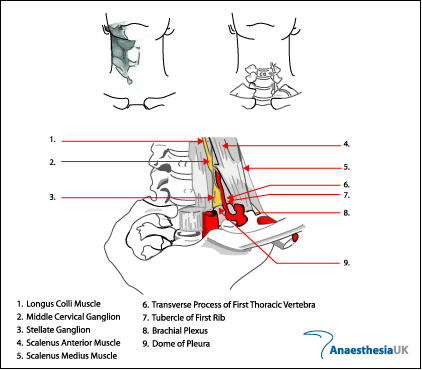 The point of needle puncture is located between the trachea and the carotid sheath at the level of the cricoid cartilage and Chassaignac's tubercle. Although the ganglion lies at the level of the C7 vertebral body, the needle is inserted at the level of C6 to avoid the piercing the pleura. Cutaneous anaesthesia is obtained with a skin wheal of local anaesthetic. The sternocleidomastoid and carotid artery are retracted laterally as the index and middle fingers palpate Chassaignac's tubercle. The skin and subcutaneous tissue are pressed firmly onto the tubercle to reduce the distance between the skin surface and bone, and in an attempt to push the dome of the lung out of the path of the needle. When properly performed, this manoeuvre is uncomfortable for the patient. The needle is directed onto the tubercle, and then redirected medially and inferiorly toward the body of C6. After the body is contacted, the needle is withdrawn 1-2 mm. This brings the needle out of the belly of the longus colli muscle, which sits posterior to the ganglion and runs along the anterolateral surface of the cervical vertebral bodies. The needle is then held immobile. Needle position is confirmed by fluoroscopy. Spread of radiocontrast is confirmed by both anteroposterior and lateral views. Failure of the solution to spread cephalad and caudad between tissue planes suggests intramuscular injection into the longus colli muscle. Immediate dissipation of the solution indicates intravascular placement of the needle orifice. A 10 ml control syringe charged with local anaesthetic is attached to the needle and aspiration is performed to rule out intravascular placement. A 0.5 ml test dose is performed to rule out intravascular injection into the vertebral artery. The usefulness of this test dose to provide early warning of intra-arterial injection is questionable, however, since seizures can occur immediately, even with very small volumes of local anaesthetic. This test dose is followed by a 3 ml epinephrine-containing test dose to rule out intravenous placement. The remainder of the anaesthetic (10-15 ml) is injected in divided doses of 3 ml with intermittent aspiration. The patient is placed in the sitting position to facilitate the spread of anaesthesia inferiorly to the stellate ganglion. The onset of Horner's syndrome indicates a successful block. Horner's syndrome is characterised by an interruption of the oculosympathetic nerve pathway somewhere between its origin in the hypothalamus and the eye. The classic clinical findings associated with Horner's syndrome are ptosis, pupillary miosis and facial anhidrosis. Other findings may include apparent enophthalmos, increased amplitude of accommodation, heterochromia of the irides (if it occurs before the age of 2 years), paradoxical contralateral eyelid retraction, transient decrease in intraocular pressure and changes in tear viscosity.